Arches under the viaduct near Piccadilly station. 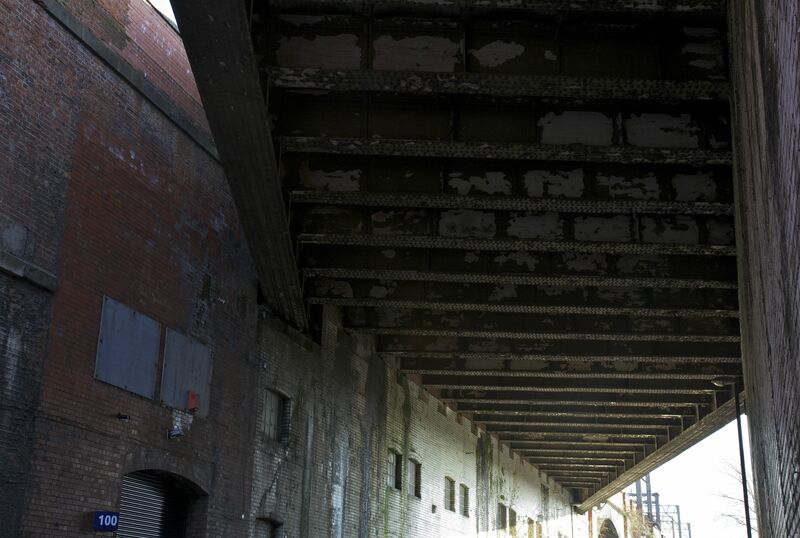 Trundling into Manchester Piccadilly on the train from Stockport is my normal way into the city: a mundane ride along the top of one of Manchester’s many Victorian viaducts. From this view from above, the city is distanced: readable, if strangely dislocated; not quite providing the sense of exaltation of seeing the city from the top of a high building, but nevertheless reassuring you that this city – of run-down factories, container storage areas, mean housing and distant hills – is understandable because seen from a secure, elevated viewpoint. Down below is another matter. 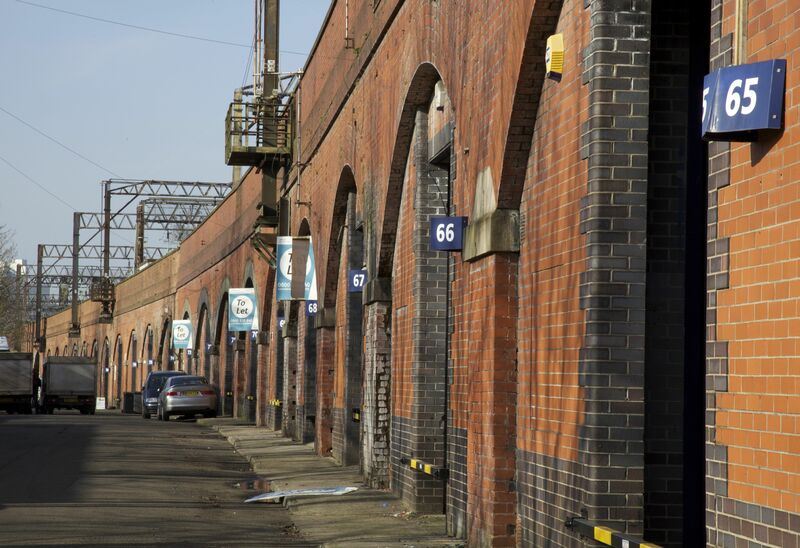 Walking this route – tracing that same railway line from below – is exhilarating for different reasons – it feels transgressive, a bit dangerous perhaps, certainly mucky and murky: this is the 108 arches to Ardwick. 1. 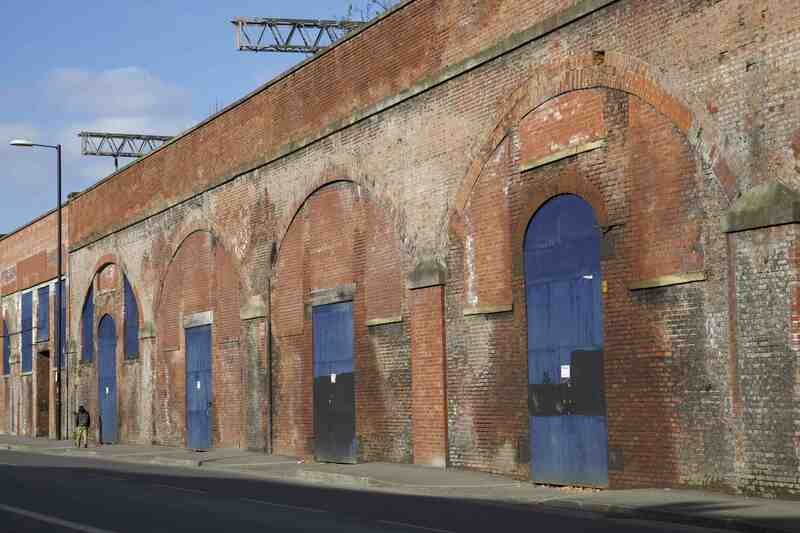 Arches fronting Temperance Street. Ardwick – the area immediately south-east of Piccadilly station – was, until the mid-19th century, a pleasant Manchester suburb, with 18th-century houses and villas clustered around Ardwick Green (some of which, along with the Green, still survive). As the city spread its industry and cheap housing over the area in the mid-19th century, it became much like any other inner-Manchester suburb: a dense conglomreration of brick-built factories, terraced housing and warehouses. The railway arrived in the 1840s, cutting a vast swathe through the area on an elevated viaduct northwards to its destination at Piccadilly. 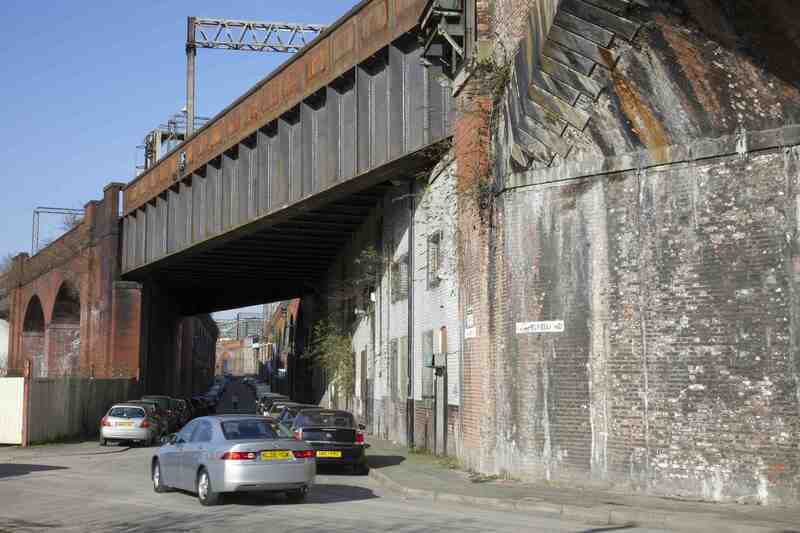 From Ardwick station, that viaduct expands and is joined by others, gaining in height as its sweeps in a graceful curve towards its terminus – ordered into a disciplined cavalcade of arches, each numbered like a series of identical shops or houses (1). 5. 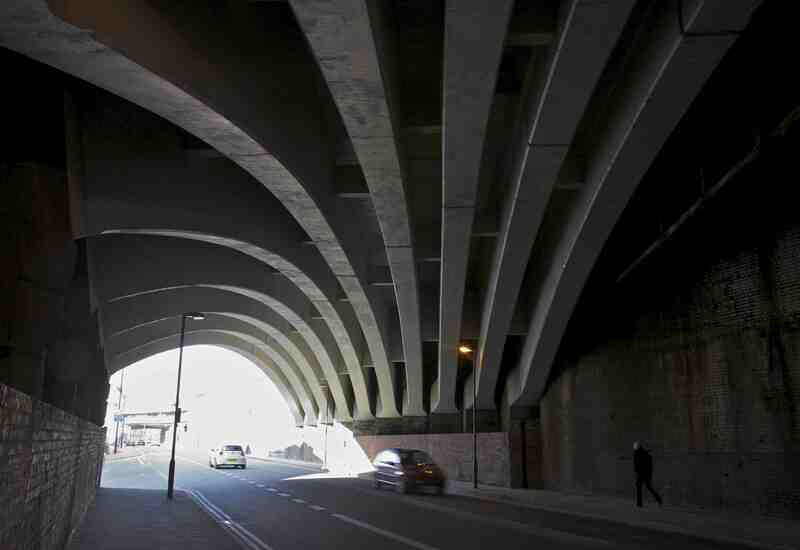 The second viaduct over Temperance Street. 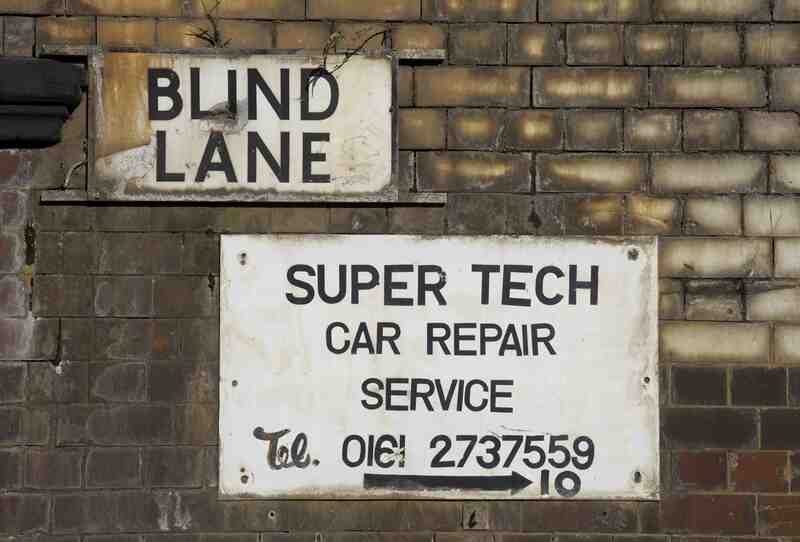 Here, down below, are streets that are forgotten: Blind Lane (2) leads only to a mechanic’s workshop; Pittbrook Street (3) stands empty under the first arch, perhaps better known by its former name; Chapelfield Road (4) further down the viaduct cuts a cavernous and threatening route through it. 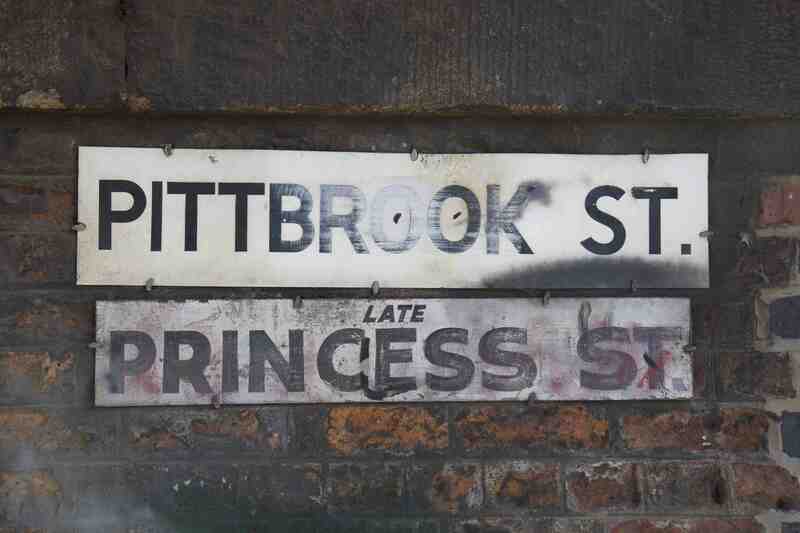 Alongside the viaduct all the way to Piccadilly is Temperance Street – an immediately Victorian name that conjures up images of discipline, order and brow-beating sermonising. But what a name for this street! Lined on both sides by the tremendous brick walls of two parallel viaducts, you certainly feel cowered into submission, tiny in the face of such overwhelming forces (5). 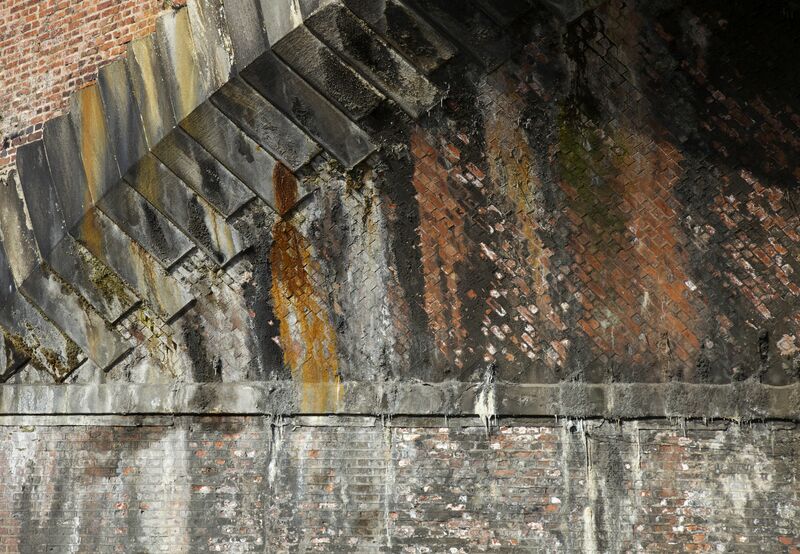 On the walls either side, trails of water leave a rich patina of moss, saturated brick, rust and sprouting Buddleia (6), while overhead is the base of another viaduct that slices through the main one at a seemingly impossible angle, its giant metal structure emphasising its savage symmetry (7). It all reaches a visual climax in the last hundred yards before Piccadilly, as the viaduct widens and passes over a busy road, creating a tunnel of vast proportions, rent in two by the viaduct above (8) and entered at one end through an expressionist portal of concrete ribs (9). 6. Patina on the viaduct walls fronting Chapelfield Road. 7. 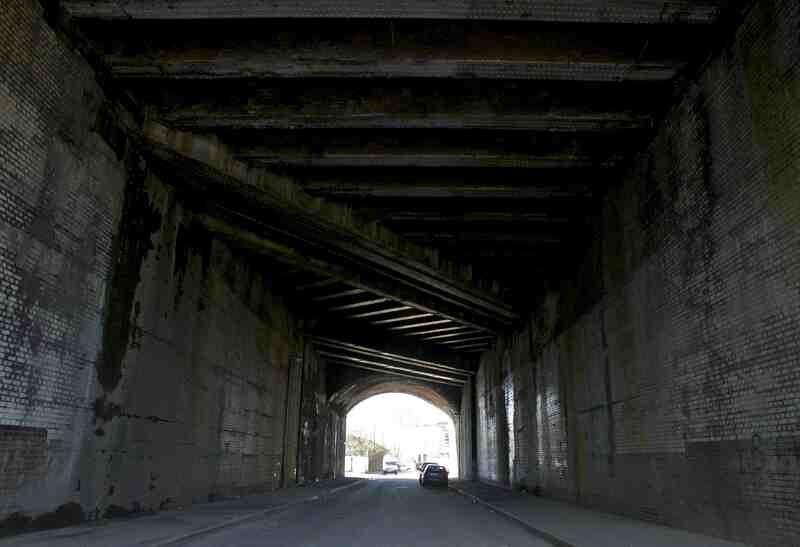 Underneath the second viaduct spanning Temperance Street. 8. 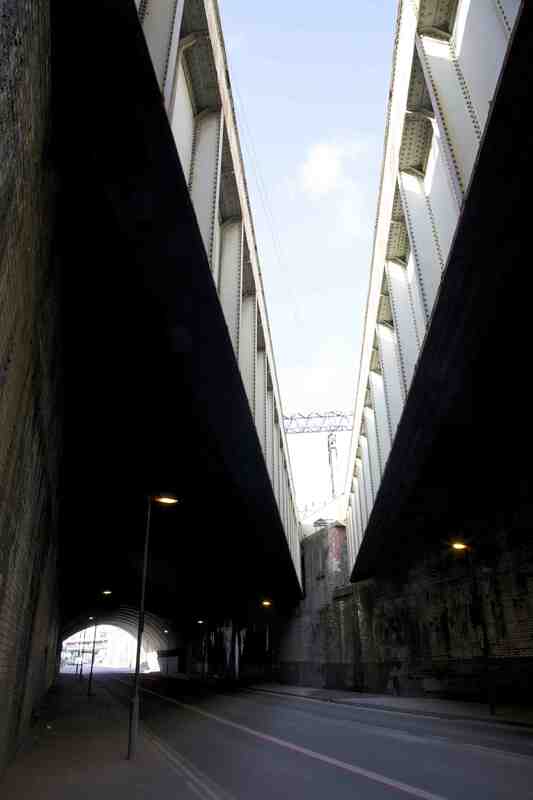 The split viaduct over Ashton Road. 9. Expressionist concrete entrance to the Ashton Road tunnel. After this, entering the civilised chaos of Piccadilly station is like walking back into another world – reassuring – yes – but also somehow mysteriously changed. What riches there are in this short walk that is all but invisible from the train above! Great stuff – train journeys seem to be the theme of the week! Thanks Diana. I guess trains will always be good places for reflection!